ArcelorMittal received the Technical Cost Savings award during PSA Group’s 2016 Best Supplier Awards ceremony. ArcelorMittal Galati plates have been shaped by Çimtaş’s perfectionism in steel fabrication. The bridge that crosses the Bay of Izmit has been a part of a 420 kilometer highway project that shortens the distance between Istanbul and Izmir by about 140 kilometers and cutting travel time between Istanbul and Izmir from nine to 3.5 hours. The whiteboard is a simple and highly effective way for people to capture and share ideas, both at work and school. ArcelorMittal’s partner PolyVision estimates they have made over eight million in the company’s 60-year history. PolyVision’s leading product is e3 CeramicSteel, a unique combination of enamelling and ArcelorMittal’s DC01EK Plus steel. But e3 CeramicSteel is not your normal whiteboard solution as it also has hundreds of applications outside the classroom! Solano® Nature provides a new roof for Vénissieux Aquatic Centre. The inter-municipal Aquatic Centre serving the towns of Vénissieux, Lyon, and Saint-Fons (France) was destroyed by a terrible fire in November 2010. But by July 2015, swimmers could once again take to the water under an impressive new roof made of Solano® Nature, an organic coated steel produced by ArcelorMittal Europe – Flat Products. 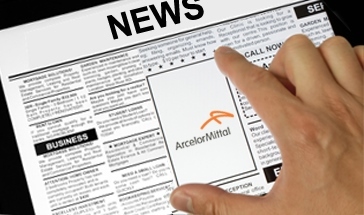 ArcelorMittal has just completed deliveries of Magnelis® for Latin America’s largest photovoltaic (PV) farm. Located in Chile’s harsh Atacama Desert, the El Romero Solar farm will have a peak capacity of 246.6 megawatts (MWp) when it comes on-stream in mid-2017. The Atacama Desert is one of the driest places on Earth and the perfect environment to collect energy from the sun. But for the structures which hold the PV panels in place, the corrosive desert winds and extreme temperatures provide a huge challenge.